I've wanted this color awhile! 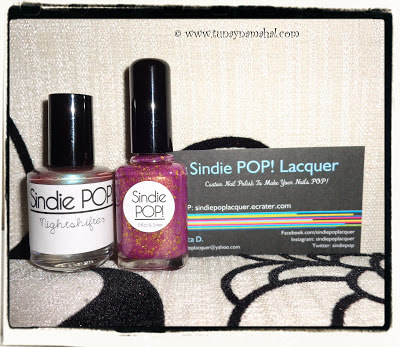 Sindie Pop Lacquer recently had a restock and Golden Raspberries was available! She also sent me a free gift of Nightshifter, which is a silvery mauve color with aqua shimmer in it. I still have to try it out. This was my first order from Sindie Pop. She packaged everything so nicely too! Sindie Pop Golden Raspberries is a gorgeous raspberry purple color with lot's of golden shimmer and sparkles. It removed pretty easy with polish remover. This was 2 coats with 1 coat of Seche Vite topcoat. *Golden Raspberries was purchased by myself. Nightshifter was included with my order as a free gift.